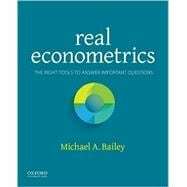 An engaging and practical introduction to econometrics, Real Econometrics: The Right Tools to Answer Important Questions provides thorough coverage of the most frequently used methods of analysis and a diverse array of examples and case studies. Grounded in contemporary understandings of causal inference, the text invites students to see how econometric tools can help answer interesting questions ranging from whether police reduce crime, to how drinking affects students' grades, and to whether or not tall people make higher wages. This emphasis on practical applications, combined with a lively and conversational narrative, provides students with a solid foundation in the analytical tools they will use throughout their academic and professional careers.